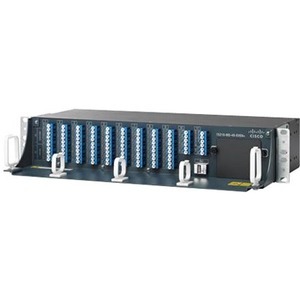 The Cisco® ONS 15216 Exposed Faceplate Mux/Demux 48-Channel Patch Panel is a standalone unit that contains both a 48-channel optical multiplexer and a 48-channel optical demultiplexer, precabled within the unit's housing. Two models are available: 15216-MD-48-ODD includes the odd-numbered frequencies as defined by ITU G.694.2, while 15216-MD-48-EVEN includes the even-numbered frequencies. The two units can be combined using the Cisco ONS 15216 48-Channel 50 GHz De-Interleaver with Coupler for in-service capacity upgrade from 48 to 96 channels.